OC-1 sand filter media is a revolutionary new product for use in sand filters as a media replacement or as a new media. OC-1 sand filter media not only has far less (almost zero) pressure loss over time, but also has a huge dirt holding capacity. OC-1 sand filter media does something not a lot of other sinking medias used for sand filters can do, depth filtration, and because of this, you backwash the media less often, remove more dirt to a equivalent or finer micron size, all while not losing pressure and flow. 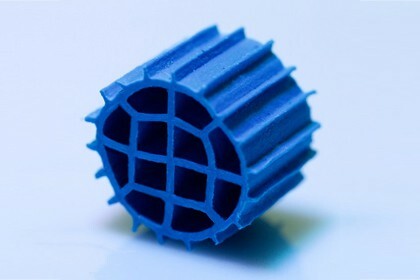 Due to the design of the media it has very low pressure loss across the filter bed. Not only does OC-1 have a massive dirt holding capacity, but the pressure loss is significantly less over time while the filter bed is loaded with solids. OC-1 can be easily applied to existing system with some simple modifications to the laterals, and to new applications with the filters either coming equipped to take the OC-1, or made compatible through lateral modification.